In hindsight, the fact that Matera is to be European Capital for Culture in 2019 would have been motivation enough for visiting Basilicata, but that was not my first objective. In fact, it wasn’t even on the list of priorities. These were, in descending order, to visit my old friend Martine Greslon and her cookery school, to make a pilgrimage to the volcanic vineyards of Mount Vulture, to spend a night at Francis Ford Coppola’s boutique hotel where Sofia Coppola was married, and to bask on golden sands by an azure Ionian Sea. Within a week, all objectives including a visit to Matera were to be achieved. Up to a point. 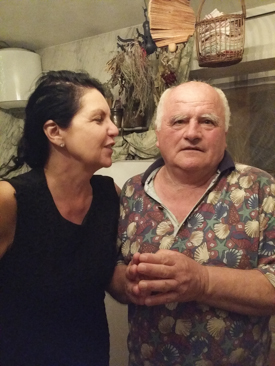 It was two decades ago when I last saw Martine Greslon at one of the London wine tastings she and her husband Trevor regularly attended for the Thetford wine merchant, T & W Wines. Via a request for some information on Jerez, we had re-established contact and she told me she was about to open a cookery school based on the local produce of her new home of Basilicata. So it was that 20 years on, our cars rubbed noses at 2 am in the car park of the hilltop town of Tursi. Following her much-scratched Renault wearily up a narrow, winding street, my hired Lancia Ypsilon became increasingly hemmed in before refusing the next steep incline and choking to a halt. After managing to haul the reluctant vehicle to the church car park at the top, I walked the final 50 yards to the spacious one-roomed apartment that Martine had renovated for her kitchen school. The Bergamot was to be my base for the week. 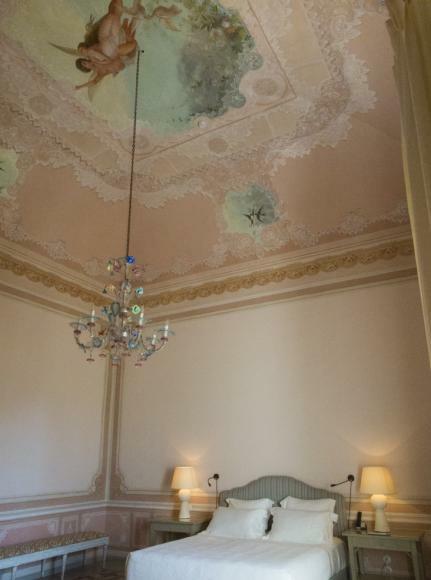 I took in welcoming Vatican candles, chaise longue, floaty net curtains and welcoming glass of Prosecco before crawling gratefully into cool Egyptian cotton sheets. After waking next morning to birdsong, a view across the valley of a medieval monastery, and to find that thanks to a mosquito net draped over the gallery bed, I had not been eaten alive, or at all. I arose gratefully to a fridgeful of Martine’s home-made pasta, apricot jam, salt biscuits, salsiccia and limoncello. Martine is the only English person living in Tursi. After splitting up with Trevor, she had run her own catering business. Another split later, an Italian client regaled her with stories of the beauty of the food and wine of Basilicata. She googled it, up came Tursi, and she bought a small flat, initially as a holiday bolt hole, but after dipping a toe in the Mediterranean diet, as it were, she moved there eight years ago. Plans for a cookery school had to be put on hold though when her backer pulled out. Now, she has one self-catering apartment and is renovating two more, with the add-on of bespoke cookery lessons based on healthy, fresh, seasonal food. ‘It sounds like a cliché but I fell in love, with the food, the landscape, the bright blue sky and amazing sunshine’, says Martine. ‘Each season offers an abundance of amazing fresh fruit and vegetables to enjoy or conserve: tomatoes, garlic, wild asparagus, wild rocket, artichokes, broad beans, cherries, apricots and peaches’. If it were your job to find a location for an Il Postino re-make co-directed by David Lynch and Federico Fellini, you wouldn’t find a better location than the village of Tursi. As if from central casting, the inhabitants are old, bent crooked and mutter in an alien local dialect. Dowdily-clad women sit on wicker chairs outside dilapidated stone houses or peer from behind shutters. Wizened men on walking sticks sit on benches together or wander aimlessly up and down narrow, winding streets whose ancient, claustrophobic stone walls bear silent witness to centuries of comings and goings. 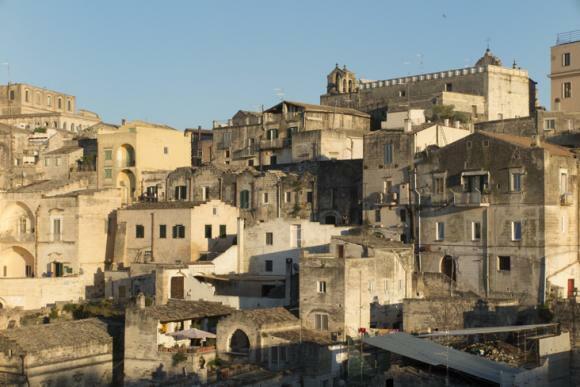 While the old village tumbles down to a featureless town below, Tursi itself is capped by the 9th century village of Rabatana, best-known today for the haunting, romantic poetry of Albino Pierro (1916 – 1995). 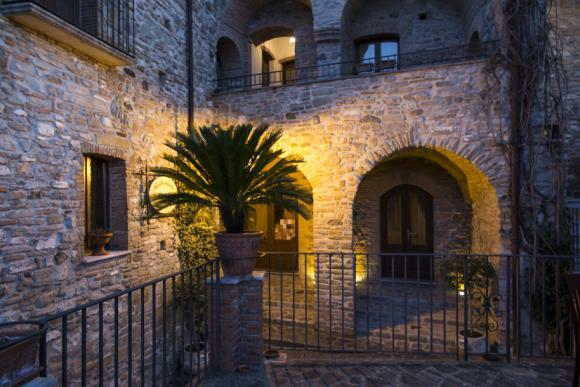 Empty houses and a ruined medieval castle testify to the fact that it’s all but abandoned except for 20 inhabitants and an unlikely grand hotel, the Palazzo dei Poeti, a potential location for the clientèle Martine aims to lure to Tursi when the cookery school is up and running. 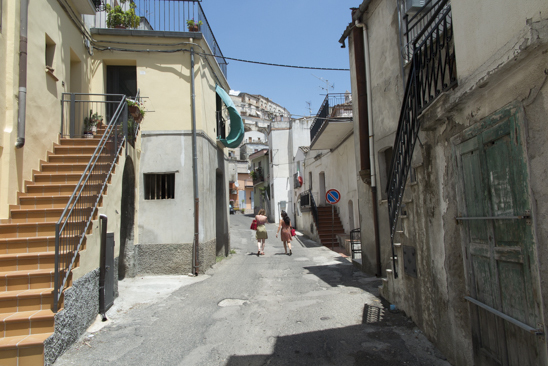 Tursi is one of many such Basilicata hilltop villages whose potent mix of intrigue, passion and superstition is all but invisible to the outsider. Banished to Basilicata in 1935 by Mussolini, Carlo Levi wrote, in Christ Stopped at Eboli, that the inhabitants of Lucania, the ancient name of Basilcata, feel that they have been bypassed by Christianity, forsaken by morality, excluded from history, abandoned by civilisation itself. It’s ironic then that thanks to a rich cultural history and an unspoilt scenic, often eerie lunar landscape of deep canyons, arid dunes and ghost villages, Basilicata today is one of the best travel destinations for tourists in search of adventure. Its former capital, Matera is an extraordinary ancient city whose biblical feel has made it a mise-en-scène location for films such as Mel Gibson’s Passion of the Christ (2004). 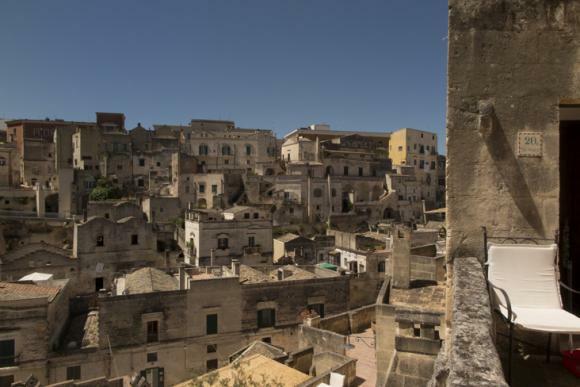 With its two dramatic Sassi districts of troglodyte cave dwellings, the Sasso Caveoso and Sassi Barisano, Matera was declared a UNESCO World Heritage site and last year voted European Capital of Culture for 2019. 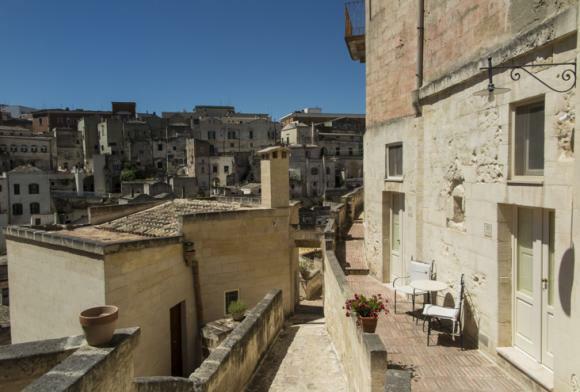 Thousands of years ago, the bed of soft sedimentary limestone that sits 400 metres above the valley floor lent itself to the excavation of the troglodyte caves for which Matera has become famous. Over time, the population used the excavated stone to build, at first hovels, and subsequently, houses constructed on an increasingly grand scale with their own garden terraces. As the plateau area at the top of the town around the cathedral square became richer, the Sassi districts grew poorer. After defeat to Joseph Bonaparte in 1806, Matera was punished, losing its capital status to Potenza. Matera degenerated, so much so that on a visit in the 1930s, Carlo Levi’s sister Luisa described the Sassis as ‘like a schoolboys idea of Dante’s Inferno.’ Descending a narrow mule path from the top of the town, she observed men, women and severely undernourished children, many suffering from trachoma and dysentery sleeping all together in caves along with dogs, sheep, goats and pigs. ‘I felt under the blinding sun as I were in a city stricken by the plague’, she recorded. 5000 inhabitants were evacuated and re-housed at the beginning of a resettlement programme in the 1950s and 1960s. But memories were so bad that instead of families returning to their renovated homes, this labyrinth of extensively renovated rock-hewn buildings was re-developed, to be leased to the professional and commercial classes in the 1990s. By 2000, the old cave houses had become dwellings for professionals, while larger structures such as rock-hewn churches were converted to hotels, some with Roman baths style sauna, jacuzzi and swimming pools. ‘When you see Basilicata, you see fields, vineyards, beautiful landscapes, you see the land as it should be’, said Francis Ford Coppola. This invocation to the scenic, mountainous landscape of Basilicata is no truer than of the Vulture region north of the capital of Potenza. From the dramatic, canyon-like calanchi rock formations in the south close to the Ionian sea, a panoramic vista of rolling hills stretches out north of Potenza dotted with dramatic hilltop villages and lava caverns. 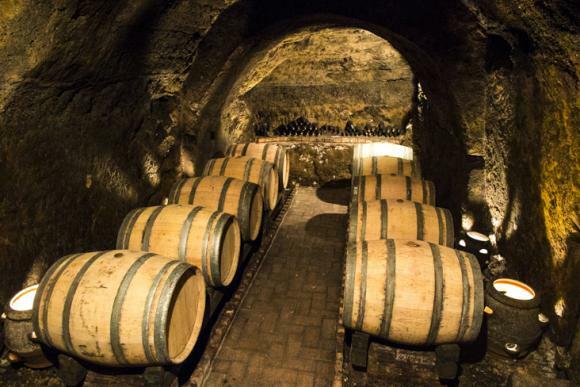 Each of Italy’s regions boasts a wine industry of some sort showcasing local grape varieties. Thanks to its ancient volcanic lava flows and an altitude of some 500 – 600 metres, the breezes that drift through the vineyard slopes on the ancient volcano of Vulture keep the vines healthy and free from rot. Vulture’s sponge-like volcanic tufa helps the roots of the vine to penetrate deep into the earth below and nourishes the vines with the waters retained by the porous bedrock in the hot, dry summers that characterise this arid region. The Vulture region covers less than 1000 hectares of vineyards, 80 per cent of which are planted to the local aglianico del vulture grape trained pyramid-style in the local capanno method. Derived from the Greek, Hellenica, the ancient aglianico ripens under the Basilicata sun late into October and even early November to produce strong, deep-coloured, robust reds. According to Vito Paternoster, whose winery is in the town of Barile at the foot of Mount Vulture, much aglianico was transported to Barolo in the early part of the 20th century to bring colour, richness and body to the nebbiolo-based wines of Barolo. Hence the local expression: ‘there’s no Barolo without Barile’. Vito Paternoster has adapted the robust aglianico to shape it for the taste of modern palates, producing some of Vulture’s most approachable wines. 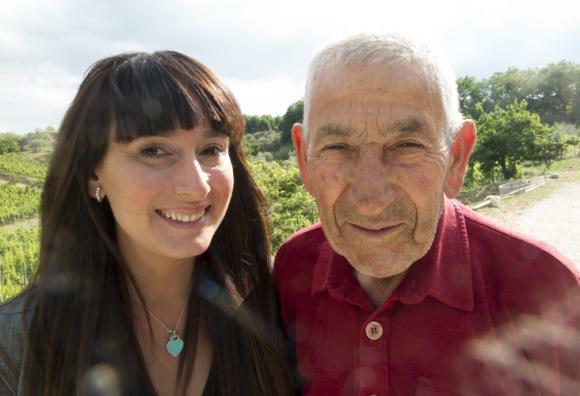 One of the younger breed of winemakers, Elena Fucci started making wine here in 2000 after studying winemaking in Pisa and inheriting some of the oldest vineyards in Vulture from her grandfather. Her training allows her to get the best modern expression of aglianico in her sumptuous red, Il Titolo, without losing its identity. In neigbouring Notaio, the Cantina del Notaiao boasts an impressive range of wines including the stylish Il Repertorio, Il Sigillo and La Firma produced from 30 hectares on the slopes of Mount Vulture and held in wooden casks in its six subterranean cellars hand-excavated by Franciscan monks in the 15th century. Surrounded by a winding, Norman wall, the medieval town of Melfi sits at the foot of the extinct volcano of Vulture. Melfi was the HQ of Frederick II of Swabia, who had cod brought from the Ionian sea to be salted and dried so that it could be eaten throughout the winter. 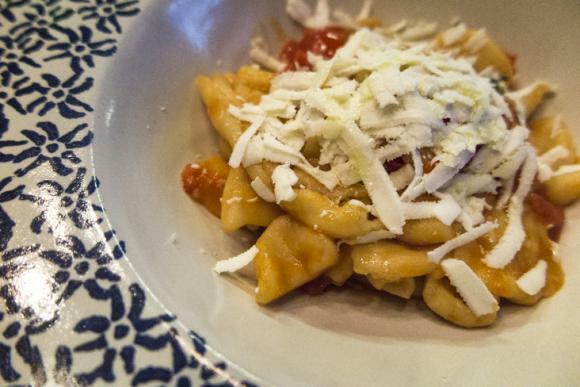 Baccalà, cooked every which way, is on the menu at La Villa in Melfi and Osteria Gagliardi in the hilltop town of Avigliano, often stuffed in ravioli with a chickpea sauce or braised and adorned with peperoni crusci, the sweet, crunchy dried red peppers of the region. 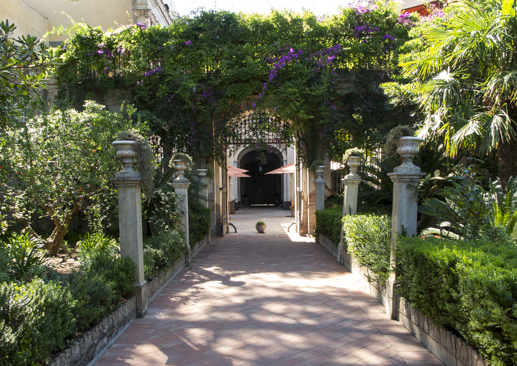 Heading back to the Ionian sea, the resort town of Bernalda contains a surprise: Francis Ford Coppola’s Palazzo Margherita, an elegant palatial villa built in 1892 that stands discreetly behind one of the many street cafés. Exit left at the back of a bar decorated with photos of Hollywood stars, you find yourself in Coppola’s exclusive boutique hotel, complete with 19th century garden and 21st century pool, all tastefully designed by the Jacques Grange with nods to Moroccan and Baroque decoration. It opened for business on 1 March 2012 after Sofia Coppola’s 2011 wedding there. A pasta session is given before dinner by Paula, one of the local staff, who taught me how to roll pasta dough and from it, craft three types of local pasta, cavatelli, orechiette and faricelli. The handiwork is passed to the young, German-trained chef, Tomaso Lacantura, who whizzes up some olive oil, chopped onions, cherry tomatoes and basil leaf, adds the cooked pasta to the pan, tosses it a few times before grating hard ricotta over it to turn it into appetite-whetting primi piatti before a candlelit dinner on the terrace outside. 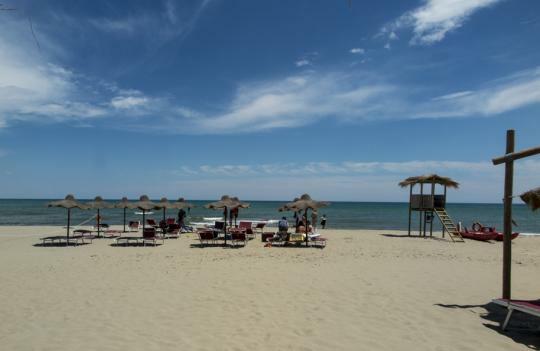 Still in search of golden sands and azure seas, I was directed by the Palazzo’s elegant manager, Rossella de Filippo, to a nearby beach on the Marina di Pisticci. A heavenly choir of cicadas accompanied me through Mediterranean pine on a short walk to La Spiaggetta’s sandy beach. It wouldn’t have been out of place in Bali or the Caribbean, but the bonus was the most divine fresh seafood cooked by the family running the beach shack: fresh grilled scampi, lobster, squid, octopus and swordfish was worth the detour even without a refreshing dip in the Ionian Sea. By this stage of the week, my disappointment at the postponement of Martine’s kitchen school was becoming a distant, hazy memory. Frequent budget flights to Bari or Brindisi. Francis Ford Coppola’s Palazzo Margherita in Bernalda. Atmospheric rooms carved out of the rock caves from ancient dwellings within Matera’s ancient sassi with hydromassage indoor swimming pool. 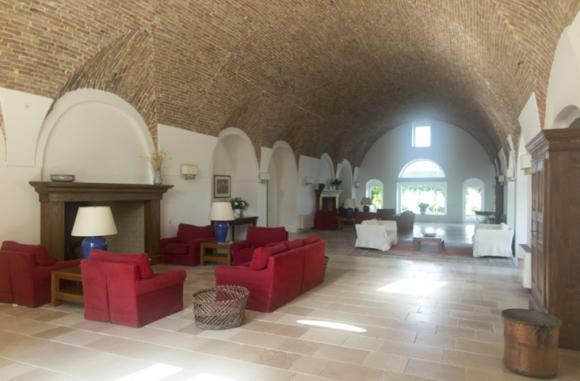 Renovated eighteenth century barn with elegantly spacious rooms and flowering terraces and pergolas, this Agriturismo with its own restaurant and winery owned by the Graziadei family. An unlikely grand hotel at the top of Rabatana, itself capping Tursi. While Martine Greslon is planning her kitchen school in Tursi next year, she rents out her renovated apartment, The Bergamot, and is converting more. 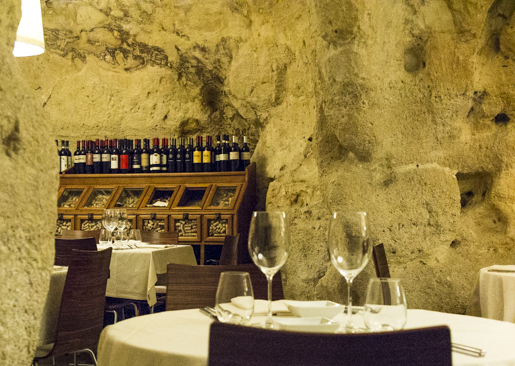 Il Baccanti is dramatically housed within the cavernous rock excavations at the foot of Matera’s Sasso Caveoso. 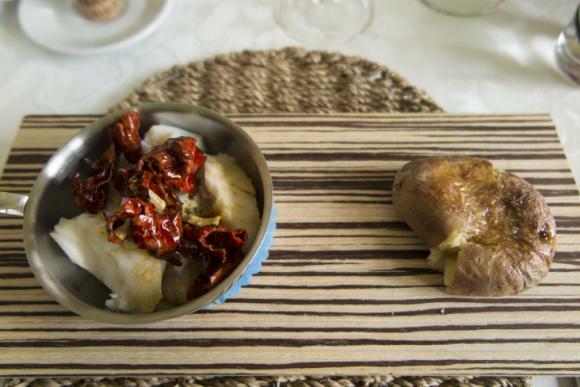 Specialities include local beef and artichoke carpaccio and rabbit with grilled peppers. The wine list includes the local Matera wine, Tenuta Parco dei Monaci. Run by brothers Gabriele and Vito Sonnessa who re-interpret the local cucina povera of the region in a modern but unpretentious way, with slow-cooked veal with provolone, roast aubergine and pepper slices dipped in anchovy breadcrumbs, courgette flowers fried in batter, ravioli stuffed with ricotta and grated olive with pesto. In this charming hilltop town near the capital of Potenza, Stefano Eificchetti, serves food that’s as local and authentic as it gets, with ravioli-stuffed baccalà and red, sweet and crunchy crusci. Vito Paternoster’s 2010 Don Anselmo is a delicious almost Barolo-like red with spicy, intense, purity of smooth dark cherry-sweet fruit and lively mineral twist. Her Il Titolo is fine modern expression of aglianico without any loss of identity. From 30 hectares on Mount Vulture, Notaiao produces an impressive range of wines.